The IncuCyte® S3 System consists of a microscope gantry that resides in the cell incubator, and a networked external controller hard drive that gathers and processes image data. 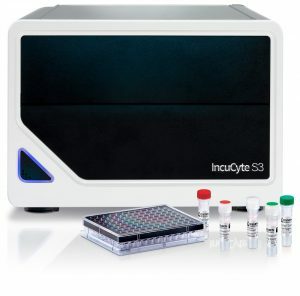 The IncuCyte S3 system comes with (4x, 10x, 20x). Each IncuCyte® S3 System can acquire >2000 images per hour. CMOS camera and efficient optics enable long-term live-cell imaging and analysis.